Howdy y'all!! 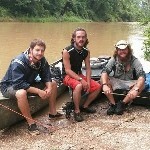 We’re Taylor, Branden and Kerry…the TEXAS RIVER TRIP crew. We’re on a journey down the Sabine River. We started south of Mineola, TX and are headed toward the Gulf of Mexico. The TEXAS RIVER TRIP crew has made a decision to make this adventure more than a personal experience. We have a desire to further research and development for a devastating disease that does not get much recognition, the American Parkinson Disease Association (APDA). Please help us reach and/or exceed our goal by making a donation today. Any donation will be greatly appreciated. And please follow, like and share our experience and mission on Facebook @ Texas River Trip as we journey toward the Gulf.